CEO Steve Easterbrook keeps working magic as he steers a remarkable comeback at McDonald's. McDonald's (MCD) wowed Wall Street again on Tuesday by providing more evidence that Americans are returning to the world's largest fast food chain. The company touted a nearly 4% jump in domestic sales and credited the launch of its Signature Crafted sandwich platform --- which include high-quality ingredients like Hass avocados and Applewood smoked bacon --- as well as a national cold beverage value promotion, for the resurgence. "We're building a better McDonald's and more customers are noticing," Easterbrook said in a statement. The latest upbeat news sent McDonald's stock jumping as much as 5% to a fresh record high. The fast food giant's stock is red hot, soaring 30% so far this year. That makes it the third-best Dow stock for 2017 behind only Boeing (BA) and Apple (AAPL). 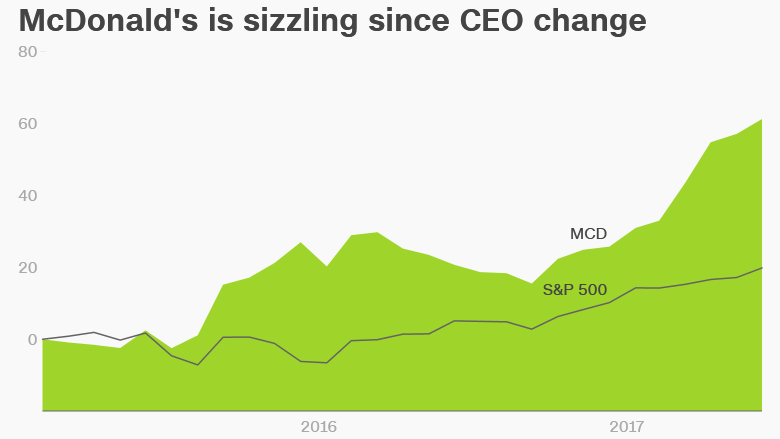 McDonald's has been sizzling ever since Easterbrook took over in March 2015 to try to turn around what was a struggling brand. At the time, McDonald's was grappling with shrinking sales, food safety scares and enormous competition from the likes of fast-casual brands like Chipotle (CMG). But since then, McDonald's stock has surged an incredible 61% -- more than triple the S&P 500's 18% gain over that span. "Momentum is building at McDonald's" and the company's turnaround efforts are "starting to bear fruit," Neil Saunders, managing director of GlobalData Retail, wrote in a report on Tuesday. Easterbrook has sought to make McDonald's more relevant by revamping its menu with all-day breakfast, healthier salads and fresh instead of frozen beef for its burgers. The CEO likes to say he wants to make McDonald's a "modern and progressive burger company." 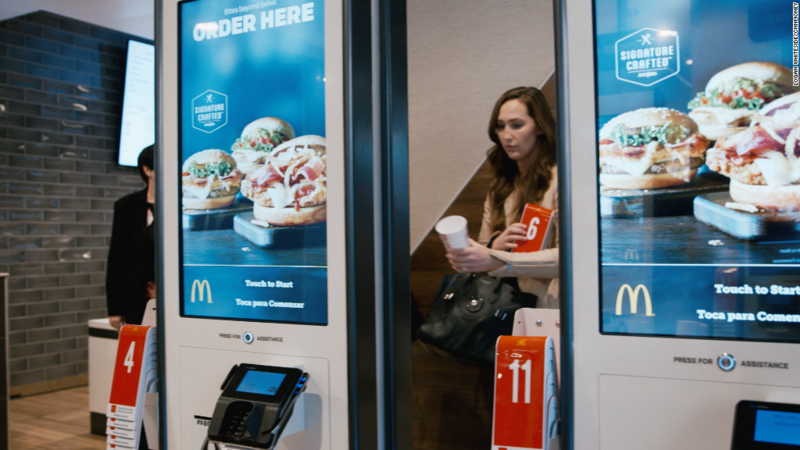 McDonald's has also taken other steps to liven up the brand, including upgrading its dated restaurant design, rolling out mobile ordering and self-service kiosks and partnering with UberEats for delivery. The fast food giant is enjoying success outside of its home market, too. McDonald's reported sales growth last quarter around the world, including in more mature markets like the U.K., Canada and Germany, as well as strength in China and Japan. Related: Will stocks plunge if Trump's tax plan implodes? But can McDonald's keep up the momentum? It continues to face tough competition and the bar has clearly been raised by Wall Street. "McDonald's remains relevant in today's competitive food market," but it often relies on a "constant stream of activity and initiatives that stimulate the interest of consumers," Saunders said in the report. Easterbrook assured investors that McDonald's is "encouraged," but not "complacent," about its recent success. He said in a statement that the company is acting with "purpose and urgency" to build on the momentum.